The White Plains Common Council voted unanimously on April to close the public hearing on the proposal to create 21 housing units in a vacant building at 37 DeKalb Ave. The applicant, 37 DeKalb Owner, LLC is seeking to establish a new Special Permit use that would allow the former 65-bed nursing home to hold multi-family housing. The Common Council, which is serving as the lead agency, is being asked to add the use to the R2-2.5 Zoning District. The two-story building at Carhart and DeKalb, which has been vacant for over eight years, would be renovated, preserving the existing structure, to accommodate 21 multi-family rental units and the addition of a third floor. 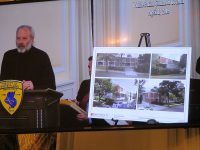 William Null, an attorney for the applicant said previously the nursing home had been a permitted use in the district, but multi-family housing is not, and since the existing building would be upgraded, the project is an adaptive reuse of the 19,100 sq.-ft. property. Utilities had been disconnected and the interior structure of the building had been stripped because the property had become a gathering place for vagrants. The zoning change would also apply to three other non-legally conforming properties in the White Plains R2-2.5 district, operating as multi-family housing, and bring them into compliance with the zoning ordinance. The zoning change would not apply to new buildings or new development projects within the district on vacant sites. The proposed building design includes development of the basement into an amenities area for residents. The first floor would include a lobby and parking garage, and the second and third floors would accommodate studio, one-bedroom and two-bedroom apartments. The proposed design for the third floor includes a setback of the dwelling units and a terrace around the entire building. No target market has yet been established for the building. The Planning Board recently agreed the proposal had the necessary elements in place for the Common Council to schedule a public hearing on the zoning change. Councilwoman Milagros Lecuona said she supported the project, but wanted solar panels on the roof. Philip Fruchter, an architect working for the developer, said his client would have “green initiatives” for the project, including potentially placing solar panels on the roof. A date for when the Common Council would vote on the zoning change was not announced last week.